Danish lighting manufacturer Louis Poulsen & Co. began production in the 1920s. In 1924, the firm hired innovative designer Poul Henningsen, whose lighting for Poulsen earned a gold medal at the Paris Exposition of 1925. In the next year, Poulsen and Henningsen were awarded a major commission to design lighting for the new Forum exhibition building in Copenhagen, where the first example of Henningsen’s innovative PH lamp series made its debut. The firm went on to sell its lighting on the international market. By the 1950s, the firm began incorporating plastic and acrylics in its lighting. Notable mid-twentieth century designers who worked for the firm include Arne Jacobsen and Verner Panton. The company... more. 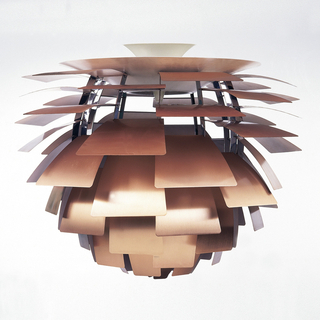 We have 3 objects that Louis Poulsen & Co. A/S has been involved with.